Blackhawk Omega Elite Tactical Vest #1 FREE SHIPPING! The Blackhawk Omega Elite Tactical Vest #1 is a versatile platform, designed with input from experienced operators. It is made from rugged nylon mesh for a combination of toughness and breathability. Its zipper front and side-release buckles make it quick to put on, and it adjusts for both length and girth to fit most officers. Its lower straps anchor it to the belt for increased stability. The front of the vest features multiple sewn-in equipment pouches for storage, including six magazine pockets capable of carrying a total of 12 M16 and M4 magazines. It also includes two horizontal accessory pouches, a loop panel for attaching patches, a removable shotshell strip, and a pair of large internal pockets. 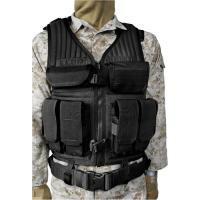 The back of the vest is equipped with extensive webbing for attaching accessories, as well as a sturdy drag handle for pulling a downed officer out of the line of fire. The shoulders come with a non-slip surface for a secure contact with a rifle buttpad, providing increased stability and accuracy. Is the belt in the photo included with the vest? What is the maximum waist adjustment for the belt? Web belt is not included. Are any of the various pouches removable? and does the vest take standard MOLLE attachments? Not removable but MOLLE compatible in the back for attachments. ©2002-2019 CopsPlus.com: Blackhawk Omega Elite Tactical Vest #1 FREE SHIPPING!